Another disappointing game week, we’ve pretty much maintained the same position in the leaderboard. As a result of falling behind early on this isn’t good enough in terms of playing catch up. Strangely though when I look at the team, I can’t see any obvious changes that I’d want to make. I’m fairly happy with the team on balance and when I look at other teams I think it looks much stronger. Having said that in an ideal world I’d want to replace Pieters and Baines, but this isn’t possible without removing one of the front six. The only positive defensively was a clean sheet for Cahill. It was very disappointing that both Cahill and Walker missed out on clean sheets in the EFL cup due to late goals. Sane, Hazard and Salah all picked up a decent amount of points. I’m reasonably happy with my midfield. I thought Sane was unlucky not to get more points against Spurs. However he is the one I’m keeping an eye on in terms of transferring out. Lukaku grabbed a goal and the star man award. I wouldn’t say he’s back to his best but he’s consistently picking up points again now. Pieters and Baines are currently adding nothing in terms of points and in Pieters case he is mainly taking points away from the overall total. At the moment I just can’t see a way of replacing him when his value is so low. The only obvious move is to take out Aguero. Baines is a similar dilemma, although his value is higher. I can’t see a player who I could swap him for at a similar price tag. Aguero started against Spurs but was substituted fairly early on. From his reaction it was obvious he wasn’t happy with this decision. He would have probably got on the score sheet had he stayed on the pitch with City being awarded a penalty. It’s a really difficult decision in terms of using the final two transfers. We haven’t been making up any ground over the last couple of game weeks but at the same time I’m fairly happy with the team other than Pieters and Baines. I don’t really want to lose Aguero just yet as not many other people have him, if he was to have a big game week this would be the best way we could climb the leaderboard quickly. I also can’t see another player who is consistently scoring every game week who would be worth bringing in. In my opinion we have the most consistent players in Salah, Hazard and to a certain extent Kane and Lukaku. As I’m fairly stuck for ideas, this week I’m looking for actionable suggestions in the comments below. With two transfers in the bank for December, what would you do with them given the current state of the team? Liverpool and Arsenal face each other tonight so it may be worth avoiding making a move for any of their players. They do both however have better fixtures on boxing day with Liverpool facing Swansea and Arsenal facing Palace. The team with the best fixtures during game week 17 is Man City as they host Bournemouth and then travel to Newcastle. For me this is a good reason to hold onto both Sane and Aguero as this could be the week one of them hits a big points total. Chelsea (Everton, Brighton), Man Utd (Leicester, Burnley) and Spurs (Burnley, Southampton) have slightly more difficult fixtures. It’s also worth noting that Morata is suspended for the game against Everton after picking up a yellow card during the week. This is a really hard one! I would really want to replace Pieters, I am fed up of getting minus points every week. I just cant find a decent combo to replace him. As you have said, the obvious choice is downgrading Aguero, who is the only non-guaranteed starter in the front 6. Although not completely sold by Sanchez – might be worth a bit of a gamble with Ashley Williams, with the games listed above, that would give us £1.2m in the bank for January. Can’t say I’m sold on either of those two options though, but surely Jesus or Morata have a much bigger potential for scoring big than Calvert-Lewin? I’m thinking along the lines of having Champions League football in the New Year. If you don’t wanna lose Aguero you could transfer out Walker or Cahill. I’d look at Rojo to replace, his price has taken a massive hit and will surely rise as plays a lot. I think he’s 2.4m then you can get rid of bloody Pieters. Plus a Utd defender for a City/Chelsea is pretty much like for like. Agree with the front 6 analysis with the exception of Sane as you touched on. He’s not a consistent point scorer, but I wouldn’t take out any of the other 5 guys unless injured. I hadn’t really thought about that. I’m just not sure Rojo will get too much game time. Also it would only leave 2.6m in the bank to upgrade Pieters. Based on points scored to date this doesn’t leave many good options. The highest scoring players in the price bracket are Hegazi, Williams and Ogbonna. I’m not sure I’d want any of those three for different reasons. Rojo plays a lot when fit, he started both games against Arsenal and City but then got a head injury, anyway he’s back now. Price dropped bcause Utd had tough opposition and conceded some goals, but he will go up a lot. Keane could be a good option to replace Pieters too as only 1.2M and bound to rise in value too with Everton playing well. He started today but not sure if that will be a regular thing, one to keep an eye on. Would mean you’d have 3 Everton tho. Yeah I was thinking about replacing Baines with Keane. Wish I’d have spotted this before kick off today as it could have been a straight swap but it wasn’t on my radar. I’ll keep an eye on Rojo over this game week to see how much game time he gets. Hoping for a big game from Sane and Aguero this afternoon. Keane could be a good one to get in while so cheap, I don’t see Everton conceding many goals under Sam. Good start from Sergio! He needs another two to make a difference. He will probably be first off in the second half. I’m so disappointed with myself! I had Baines for Williams and Sane for Silva locked in for transfers last night but I cancelled it due to not knowing when Silva was back due to personal reasons. Bertrand and Soares both struggling with injury and Saints have a tough Christmas period. Add to the Pelligrino seems to have issues with VVD and Hoedt… that backline is far from settled. I would steer away from Saints defenders! I can see us nosediving through the league to a relegation scrap! Obviosuly Jesus and Morata are much better options, but don’t would have liked a better upgrade in defence. I was pondering this for about 45 mins earlier and drew a blank! Yeah I did think that’s the reason they are so cheap. I’m not getting anywhere with it either which suggests sticking with what we’ve got for now. Any thoughts on Keane for Baines? Had I been more on the ball could have done this today to free up a bit of budget as well. If Stoke keep a clean sheet today we will know everything is against us this season – no Pieters this afternoon. 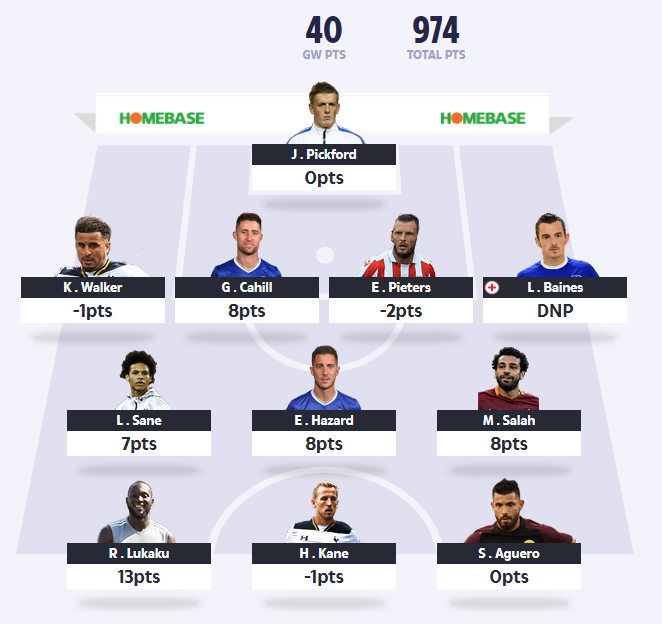 I enjoyed game week 16…my main team got 86 points, now racked 920 and with 2.6m in the bank for January (always good to have spare change makes transfers easier and allows more options). Sold Kolasinac last night, one of my players of the season, brought him for 3.8 and sold for 5.6 (nice 1.8m profit). I always try to make profit on all players, buy low and sell high, gives more flexibility in picking players. Done 15 transfers now, made profit on all expect Foster. Brought Walker as looks good value at 4.5m. Any thoughts on what you would do with my team with two transfers in the bank for December? I plan to stay as I am for this game week. Yeah I couldn’t see any obvious move so it made sense to stick as we are. Glad we got a bit of luck this weekend. Hoping for a good Boxing Day. Typical I put smalling in and he gets injured… Funny old game. However Pickford kept a clean sheet again. Yeah it’s typical, any transfers left or you stuck with him now? I think based on form that 442 is the way forward. I have broken into the top 250 now off the back of it. Everybody in top 10 in my league is 442 & im trailing 150 points with a 443. However i did gain quite a few points this week with Kane & Aguero having good games.Maybe the long term strategy is still the best option in the long run. What do you think DTT? I prefer 4 3 3 purely for the fire power we’ve seen from the likes of Lane today. Traditionally strikers have always scored the most points. However from looking at the list of top point scorers this season, midfielders seem to be doing a better job. DTT, I wouldn’t consider doubling up on Everton back five until 20th January onwards, can Man utd start accruing clean sheets again, smalling being the obvious one when back in team, Rojo to risky, or if funds aren’t an issue, doubling up on Chelsea defenders, have Chrisenton, Cahill gametime risk, Azpilcueta & Alonso being the obvious ones. I was just going to do a like for like swap with Baines. I’ve got 2transfers left and I have Pierters in my team. I am happy with my front 6 just now, so I can’t see me using my 2 transfers, you don’t have to use them do you? You don’t have to use them. But they won’t get carried over to the next month. With two transfers, I would replace Pieters, I don’t know why he is so popular here. He struggled to get 50 points last season and so with 10 points so far he would struggle to match it. Replace with who though? I’m obviously keen to replace and I’m not a fan but I’d have to lose one of the front 6 as well. So who comes out and who goes in? Haha I don’t think it’s that decent. Mainly players performing who everyone else will have. Jumped 60,000 places on the Leaderboard…. Not too shabby! Baines was stated out most of moth on many websites..
I’ll be having a think about it before the weekend. It’s not a bad idea though. In terms of holding injured players – no one had suggested Keane before I mentioned it over the weekend, had someone spotted it and suggested it before kick off on Saturday I’d have probably made the transfer but at the time no one had any obvious ideas. Regardless Keane has only played this game week – he’s had a good week but it’s only cost us 21 points not 30-40. 700k in the bank, thinking of replacing foster with pickford. Current back line is foster, Gomez, Valencia, christensen, Cahill. I know Valencia is injured so will replace him in Jan with Walker. What are you thoughts of replacing foster with pickford with my remaining Dec transfer? Looks like a good move, it’s the same one I did a while ago. Love this site. Seeking some advice from all the experts on here. I have 1 transfer left to use before next Friday team is 2nd in my league on 1278 points – 13 points behind . Staying 4-3-3 and swapping Jesus for Aguero? No a big fan of Jesus or aguerro due to rotation although aguerro is looking great at the moment he will be rotated. You have transfers to use by this weekend, on the morning of the first you will have 3 new transfers and all old unused ones will disappear. Both Jesus and kaku are not doing great for points. My personal picks for strikers over Jan. If I could pick three I would have these three. I’d probably get rid of Jesus as well. I’d be tempted by Sterling even though I’ve got Aguero myself. I’d potentially consider Morata as well. Before the morning price changes ? Didn’t make any. Will probably just do a straight swap by bringing in Keane for Baines tomorrow. Trying to decide better option. DTT no choice but this guy must go !!! 2 extra games this month for Chelsea, man city and arsenal. City having the easiest run. About time we started talking about future plans. Best city options for me. Kdb, sterling, Silva, sane. In that order. Morata, hazard, Alonso in that order due to hazard playing well but not in a fashion that works for dream team. Arsenal is the one I’m really stick with. Laca. Should be a great option given the injuries at asenal but I still don’t see him getting many 90 mins on pitch and the style of play doesn’t seem to suit him. Sanchez. Too much of a headache to pick up considering his impending move over the Jan window. Mustafi. Stand out player very expensive for my taste, would take otamendi for the money given form and fixtures. Noone in the arsenal team lighting my fire, I currently lack any man u cover also due to them passing the points around alot more and kaku playing deeper in an almost holding role allowing wingers to score. Ali looks to be hitting form now, he would be an amazing asset at the price he is currently. It was about this time of year spurs picked up pace with him and kane looking dangerous. Any dealings today DTT ? Yeah I’m probably going to swap Baines for Keane. Then look at sane and pieters next week with money from the lukaku deal to play with ? Where’s DTT’s weekly update? I want to read about his successful game week. I’m just writing it now – had a busy week so trying to catch up.